High cholesterol levels is a problem of millions of modern people regardless of their race, nation, gender or age. Specialists estimated that in the year 2008, only in the Great Britain there were more than 60 thousand people who suffered from negative effects of high cholesterol level. This common metabolic condition can cause quite serious consequences, including heart disease, atherosclerosis and other related health problems. Unfortunately, within the last decade hyper-cholesterolemia (high cholesterol levels) has been a diagnosis for many young people and teenagers. At the same time, a positive fact is that there are natural ways to lower cholesterol levels in the blood. One of such ways is adding certain foods and products like whole grains, fish, olive oil, olives, almonds, walnuts, pomegranate, avocado and others, which can assist in cholesterol level lowering. Recently, Austrian scientists discovered that such natural product as rapeseed oil can be also added to the list of cholesterol level lowering products. It is especially effective for decreasing blood fat and cholesterol levels in those people, who suffered from such conditions from birth. 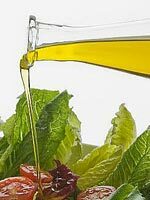 18 participants of the scientific experiments in Vienna were offered a low fat diet enriched with this oil. During the first 60 days of the trial, the participants had about 15 g of rapeseed oil every day, and for the next ninety days their daily dose of this oil was increased up to 22 g. As a result, after about a half-year treatment 29 percent of the participants demonstrated an improvement of the cholesterol concentration. Moreover, Polish medical scientists confirmed the findings of their Austrian colleagues and recommended to combine rapeseed oil with garlic, in order to achieve better effects. It turned out that rapeseed oil contains unsaturated fats which assist greatly in triglycerides (blood fat levels) and cholesterol lowering. Also, this oil has lower amounts of saturated fats than other oils (in particular, olive oil). If you need to keep cholesterol levels under control, add some of high quality rapeseed oil to your salad or other meals. Or, it is possible to use this oil for frying. Remember that therapeutic effects could be achieved only if a high quality rapeseed oil is used. In Britain, you can look for British Cold Pressed Oil which is produced using the technique of cold pressing. Finally, do not forget to consult a health care specialist prior to staring a rapeseed oil therapy.